On any given month, I receive a little over fifty emails requesting reviews of your favorite burger joints. To get to all of them is pretty much an impossible undertaking. There are a few burger joints for which I receive multiple requests. These burger joints grab my attention because obviously there is something worth checking out at these places. 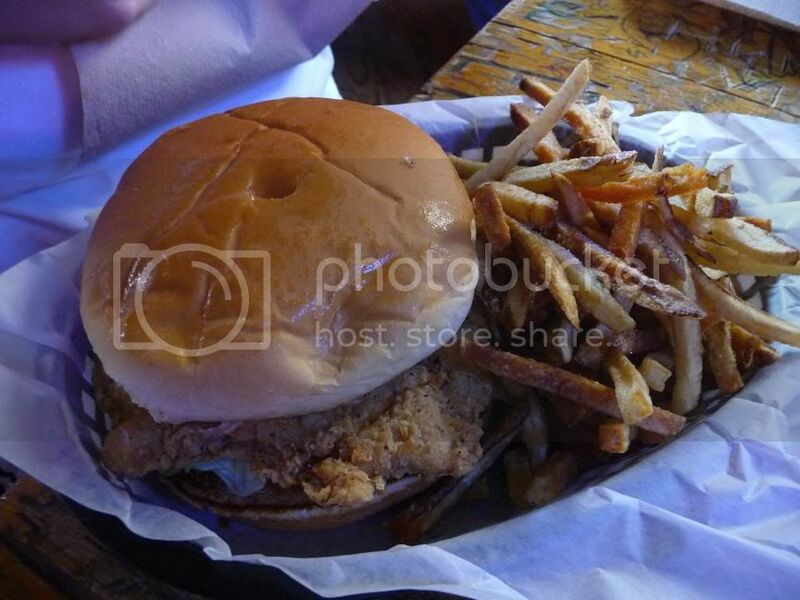 Koppe Bridge Bar & Grill in College Station, Texas is one such burger joint. I have received no less than twenty one review requests for this one burger joint. I felt obligated to check this place out. My curiosity peaked this past weekend and I made the trek to College Station to visit this highly recommended burger joint. Would I leave Koppe Bridge disappointed? Was there something to all the hype this place received? 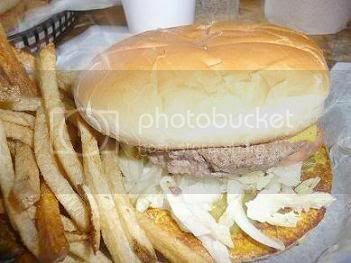 Would I find the greatest burger of all time at Koppe Bridge? These questions and more filled my head as I approached the wooden structure known to Bryan/College Station locals as the “Best Big Burger in Town”. With twenty one review requests received for Koppe Bridge, the numerous Best Burger awards adorning the walls of Koppe Bridge and the “Voted Best Burger 1999-2007” image printed next to the Koppe Bridge Cheeseburger on the menu… the expectations for the Koppe Bridge Cheeseburger really couldn’t have been set any higher. I halfway expected to see lepers rubbing the burgers on their bodies to rid themselves of their illness or maybe see a man walking on water after consuming a Koppe Bridge Cheeseburger… It hadn’t quite reached that level yet but it was rapidly approaching. With all the hype, I couldn’t wait to sink my teeth into one of these burgers and see what all the hubbub was about. I approached the counter where you place your order, reviewed the menu and ordered. I scanned the interior of the restaurant for a table large enough to seat me, Mrs. TBG and my two little TBG kiddos. While waiting for our order to be called, an Aggie basketball game was being aired on one of the many flat panel TVs in the place. I’ll discuss the atmosphere of Koppe Bridge later in the review but what a fantastic atmosphere this place has!!! All that was needed to complete the scene was a fantastic burger and fries. As I sat there watching the Aggie faithful witness a dismantling of the Iowa State Cyclones basketball team on national television, I couldn’t help but think about all the readers who enthusiastically recommended Koppe Bridge. I glanced around and read some of the certificates received by Koppe Bridge for their burgers. I couldn’t wait to receive mine. Finally – my name was called and I proceeded to the pickup area to gather my very own Koppe Bridge Cheeseburger. The wait was over. The time was now to find out if this burger was for real. Probably since I have eaten more than my fair share of burgers and have now reviewed 30 burger joints, I quickly assessed the Koppe Bridge Cheeseburger as doing really well in the Herd Killer category. The burger was by no means dry. In fact, it looked quite juicy and very tasty from the outside. My first bite confirmed what I suspected... high Herd Killer but low Oooze. It was not dry at all but it wasn’t ooozing much on my hands or on the white paper lining the basket it was delivered in. In fact, no oooze was seen on the paper at all. Not dry but not dripping with ooze either. 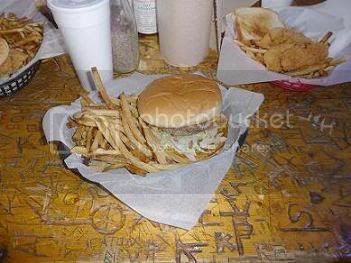 If you can somehow eat the Koppe Bridge Cheeseburger with just one hand… I’d say you have a career in the NBA waiting for you. This is one serious burger with some serious size. Bring a friend. You may need them to help shove this thing in your face. 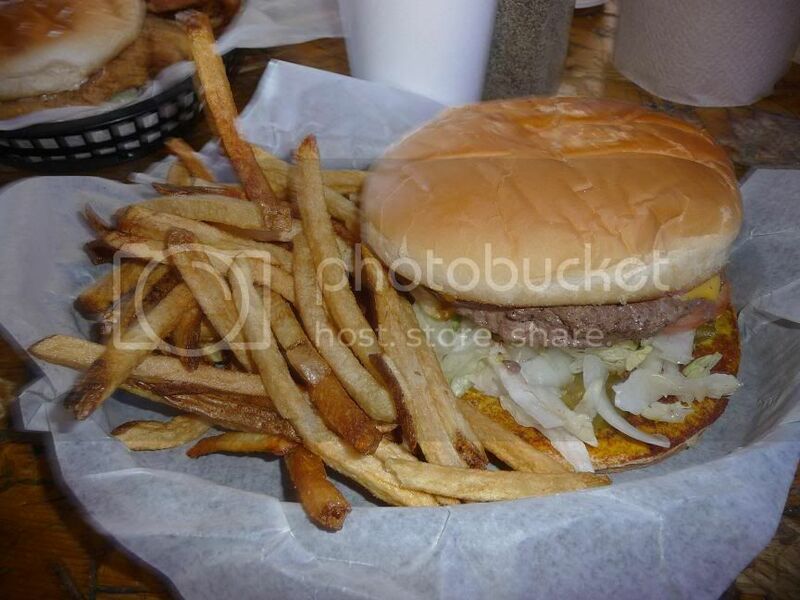 Koppe Bridge offers a Cheeseburger Basket which includes the monster cheeseburger, fries and a drink for $6.95. For my family, we ordered two kids meals, a chicken sandwich and my monster burger and got out of there for about $30 bucks. All in all not too bad considering you probably won’t need to eat for another 24 hours after leaving Koppe Bridge. I was very satisfied with the value. 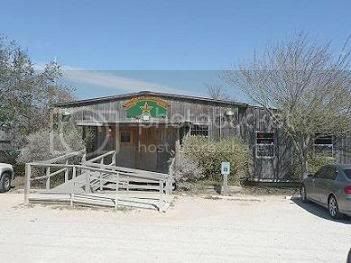 I’m sure eating at Koppe Bridge day after day would probably end your life sooner than expected. There was a lack of Oooze that I have to consider in this category but there was also a heaping pile of cow between the buns as well that would keep me right with my maker should I regularly dine on Koppe Bridge Cheeseburgers. Overall - I glad I made the trip to College Station to dine at Koppe Bridge. The burger was definitely huge. The fries served with the burger are the natural cut fries that I absolutely love. The fries looked like they have a potato slicer in the back and fryer. If I had to guess, I’d say they make the fries fresh on-site right before serving them. It just doesn’t get better than that if you ask me. The issues with the burger were noted above. I would recommend Koppe Bridge consider evaluating their burger’s flavor more closely as I think the dominant flavor is beef which absent seasoning can be bland. Some added veggies, condiments and cheese could help add some much needed flavor to the mix. I will get into the atmosphere in a second here, but the cheeseburger was really good. 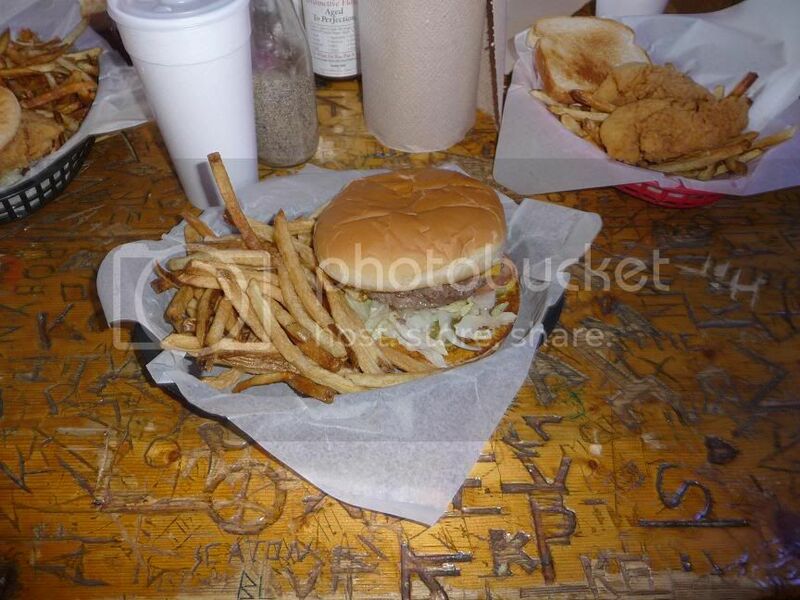 If you are in the area and in the mood for a good ol’ fashioned burger joint experience, it’s hard to find a place better than Koppe Bridge. Approaching Koppe Bridge, Mrs. TBG said it was “ominous" and that it "looks like a club." 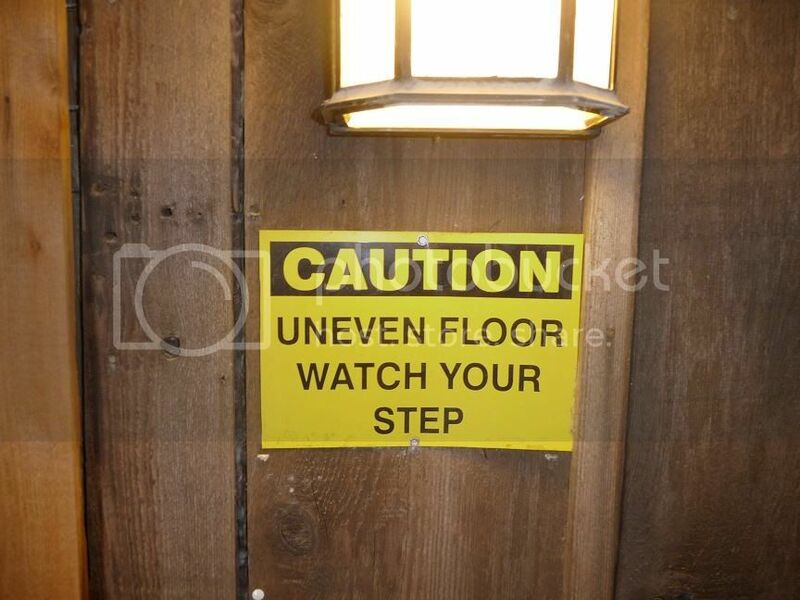 Before you enter the restaurant, you are greeted with a sign that warns that the floors inside are uneven and to watch your step. When I read this I laughed out loud. I quickly thought about Lankford’s Grocery in Houston that has very uneven floors but I don’t think they have a sign warning people about them… Once inside Koppe Bridge it was clear to me why they have the sign posted outside. As soon as somebody walked close to you, you bounced. Literally, the floor was bouncing below you as somebody walked by. That’s just awesome! I don’t care who you are, if you can’t appreciate a place that stays as busy as Koppe Bridge while sportin’ bouncy floors… maybe burger joints aren’t your thing. I bounced to my table and found yet another VERY positive sign that this burger joint was unique. The tables have been carved up pretty handily by previous Koppe Bridge patrons. I just love seeing this too. It tells me this place has been in business for a long time and the atmosphere is relaxed and easy going enough that they don’t mind if you bring some woodworking tools with you to lunch. That’s just awesome! We tried the chicken sandwich and the kid’s chicken fingers. Mrs TBG said the chicken sandwich was awesome. A quick bite of it confirmed her opinion. A sampling of the kid’s chicken tenders also confirmed why both mini-TBGs had clean plates at the end of lunch. Quite possibly the best fries I have had in a while. The closest to these are what are called Bosque Fries. These are homemade fries invented by a close friend of mine in Bosque County. They are awesome. 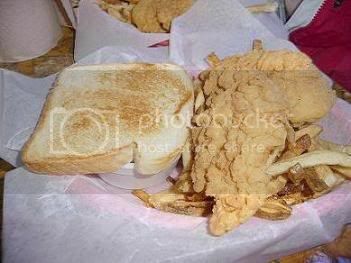 The Koppe Bridge fries are right up there. Koppe has all the elements of a great burger joint. It has a loyal following of customers. It has a very casual atmosphere. It is a great place to just hang out, eat a burger and watch a ballgame. If shooting pool and playing video games if your thing – Koppe Bridge has you covered. It’s a great place to just hang out with friends. You can also sit out on the patio as well if you’d like. The waitstaff was very helpful and polite. Despite being very busy they were able to get my food out pretty quickly and were willing to answer my questions about their menu. 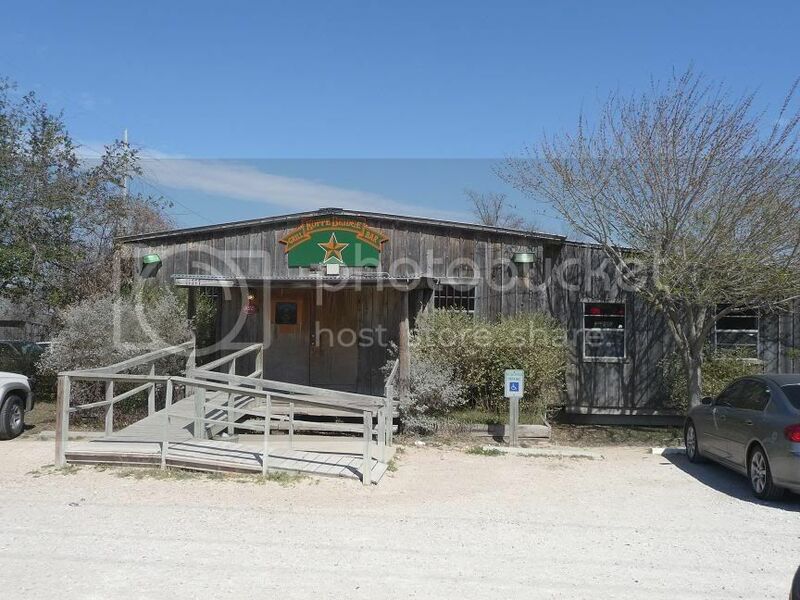 Koppe Bridge has two locations in College Station. I went to the original on Wellborn which opened in 1992. Their second site, opened in 2002, is on Harvey. Koppe Bridge provided a great dining experience. If you enjoy a good old fashioned burger joint the way they were meant to be, come to Koppe Bridge. The burger was good. The environment was better. I’d go back again and again if I lived closer. Wow! Good to see you're reviewing burger joints again! I live in New York, but always enjoyed reading your reviews, hoping that one day I'll happen through Texas and get to apply them to good use. I lived just a few minutes down the road back in college. I only had the burger a few times, but the grilled chicken sandwich is easily the best I've ever had. Glad you finally got to check it out! In the past year (since your last review0 I have checked your web site regularly for a new review. Glad to see you are still reviewing and blogging on great texas burger joints. 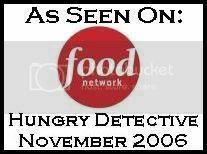 Hope to see more reviews in 2009. So glad you're back - your reviews have been missed. Glad to see you back! Bring em on! I discovered this site about 6 months ago and imagine my excitement when I realized you were reviewing right here in Houston!!! My Family and I have hit all the North Houston joints in your reviews.... Viva la Mel's!!! Keep up the good work! I look forward to seeing more Houston **hint hint** reviews this year! TBG, I was one of the 21 requests. Glad you got around to doing the review and even happier that you enjoyed it! As a former employee of Koppe Bridge (1993 - 1994) I still take pride in the great food they make there. Yes, the fries are cut fresh in the back, soaked in a little warm water to leach out some of the starch and then dropped in the fryer. As fresh as they can get! KBBG, please tell Delph that Kip said hello! I grew up in College Station and since I've moved to Austin for University I've missed Koppe Bridge's fries tremendously! My family has had birthday's, grad parties and so much more here. Glad to see that you liked it. sadly Koppe Bridge has recently changed the oil they use for the french fries. I hate it. If I wanted healthy food I wouldn't be going there in the first place. Bring back the good tasting, bad for you fries! I recently ate at Koppe Bridge and it seems to me that they have copied the burgers from Chicken Oil Company. Even the atmosphere seems pretty identical. I used to work there while I was in college. The seasoning is salt and pepper in a single shaker. People used to come in all the time and ask what we used. Also to confirm the note, the fries are made fresh on site multiple times a day using a wall mounted fry cutter. Just an atmosphere fast fact for you, the place gets its name from an actual Koppe Bridge. The bridge was rebuilt and the owner used the wood from the old bridge for much of the floor in the original sections of the building. I went back recently (after many years) and they had expanded quite a bit.